Food preservation is one of the most intimidating aspects of homesteading, yet one of the most important. Although there is a plethora of websites, books and blogs dedicated to learning how to preserve the harvest, people must search multiple places in order to gather the necessary information. For a beginner new to the world of preserving this leaves them frustrated and quite discouraged. The ideal tool for a newbie is a detailed reference guide, one such as The Farm Girl’s Guide to Preserving the Harvest, that shares the basics on canning, dehydrating, freezing, fermenting, curing, and smoking, and how to use the right tools for each method. 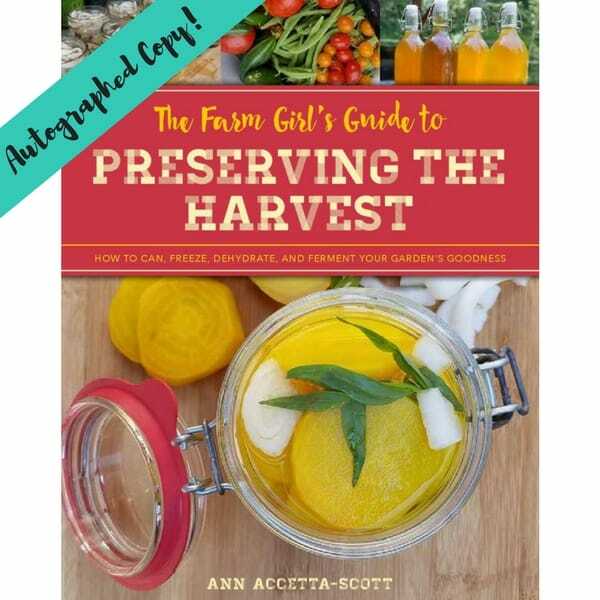 Homesteader and blogger Ann Accetta-Scott guides readers at the beginning, moderate or advanced levels of preserving. Newcomers to the world of preserving can start with a simple jam and jelly recipe using a hot water bath canner, while others may be advanced enough to have mastered the pressure canner and are ready to move onto curing and smoking meat and fish. The progression in this book will help the home preserver build confidence in the most common methods of preserving. Also get access to our FREE The Farm Girl’s Guide to Preserving the Harvest eCourse with your preorder.